The following procedure apply if you have an existing WSUS server installed on a Windows 2008 R2 OS with SQL Express and you wish to migrate to Windows Server 2012 R2 WSUS server and a separate backend database server. Log on to existing WSUS server. Open SQL Management Studio>Connect to DB>Right Click SUSDB>backup full database. The WSUS Setup program copies WSUSutil.exe to the file system of the WSUS server during installation. You must be a member of the local Administrators group and WSUS Administrator Group on the WSUS server to export or import metadata. Both operations can only be run from the WSUS server itself and during the import or export process, the Update Service is shut down. Move the export package you just created to the new Microsoft WSUS Server. If you have .netFramework v.2 or v.4 but not configured in IIS Application. Then most likely above command will fail giving you some grief. Here is a solution for this. If issue persists, please try to unapprove KB3020369 in WSUS Console then try again. Re-run the wsusutil command but instead of making a CAB file make a .xml.gz file and all should be well. Virtualize a new Windows Server 2012 R2 Server. Setup static IP, Join the server to domain. Install .NetFramework 4 in new server.Do not Configure WSUS at this stage. Go to Step4. Restore old SUSDB to new SUSDB with override option. Assign sysadmin, setupadmin role to the person who will install WSUS role in new WSUS server. Step5: Install WSUS Role & Run Initial Configuration Wizard.  Log on to the server on which you plan to install the WSUS server role by using an account that is a member of the Local Administrators group.  In Server Manager, click Manage, and then click Add Roles and Features.  On the Before you begin page, click Next.  In the Select installation type page, confirm that Role-based or feature-based installation option is selected and click Next.  On the Select destination server page, choose where the server is located (from a server pool or from a virtual hard disk). After you select the location, choose the server on which you want to install the WSUS server role, and then click Next.  On the Select server roles page, select Windows Server Update Services. Add features that are required for Windows Server Update Services opens. Click Add Features, and then click Next.  On the Select features page. Retain the default selections, and then click Next.  On the Windows Server Update Services page, click Next.  On the Select Role Services page, Select Windows Server Update Services and Database, and then click Next.  On the Content location selection page, type a valid location to store the updates. For example, type E:\WSUS as the valid location.  Click Next. The Web Server Role (IIS) page opens. Review the information, and then click Next. In Select the role services to install for Web Server (IIS), retain the defaults, and then click Next.  On the Confirm installation selections page, review the selected options, and then click Install. The WSUS installation wizard runs. This might take several minutes to complete.  Once WSUS installation is complete, in the summary window on the Installation progress page, click Launch Post-Installation tasks. The text changes, requesting: Please wait while your server is configured. When the task has finished, the text changes to: Configuration successfully completed. Click Close.  In Server Manager, verify if a notification appears to inform you that a restart is required. This can vary according to the installed server role. If it requires a restart make sure to restart the server to complete the installation. Open Server Manager>Add/Remove program. It will provide you with previous installation Wizard. Launch Post Configuration Wizard.  On the Welcome page, click Next.  On the Installation Mode Selection page, select the Full server installation including Administration Console check box, and then click Next.  Read the terms of the license agreement carefully. Click I accept the terms of the License agreement, and then click Next. On the Select Update Source page, you can specify where client computers get updates. If you select the Store updates locally check box, updates are stored on WSUS, and you can select a location (E:\WSUS) in the file system where updates should be stored. If you do not store updates locally, client computers connect to Microsoft Update to get approved updates. Make your selection, and then click Next. On the Database Options page, you select the software used to manage the WSUS database. Type <serverName>\<instanceName>, where serverName is the name of the server and instanceName is the name of the SQL instance. 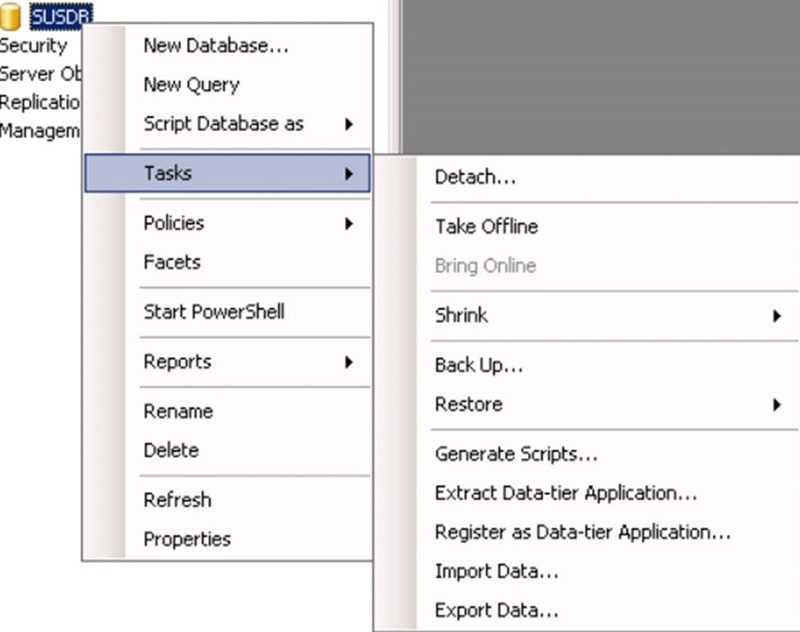 Simply type remote or local SQL Server Name and then click Next. On the Web Site Selection page, you specify the Web site that WSUS will use to point client computers to WSUS. If you wish to use the default IIS Web site on port 80, select the first option. If you already have a Web site on port 80, you can create an alternate site on port 8530 by selecting the second option. Make your selection, and then click Next.  On the Ready to Install Windows Server Update Services page, review your choices, and then click Next.  The final page of the installation wizard will tell you whether or not the WSUS 3.0 installation was completed successfully. The final page of the installation wizard will tell you whether or not the WSUS 3.0 installation was completed successfully. After you click Finish the configuration wizard will be launched. In the WSUS console of the old WSUS server, click the Options tab, and then click Advanced in the Update Files and Languages section. In the Advanced Synchronization Settings dialog box, check the status of the settings for Download express installation files and Languages options. In the WSUS console of the new server, click the Options tab, and then click Advanced in the Update Files and Languages section. In the Advanced Synchronization Settings dialog box, make sure the settings for Download express installation files and Languages options match the selections on the old server. On your old WSUS server, click Start, and then click Run. In the Run dialog box, type ntbackup. The Backup or Restore Wizard starts by default, unless it is disabled. You can use this wizard or click the link to work in Advanced Mode and use the following steps. Click the Backup tab, and then specify the folder where updates are stored on the old WSUS server. By default, WSUS stores updates at WSUSInstallationDrive:\WSUS\WSUSContent\. In Backup media or file name, type a path and file name for the backup (.bkf) file. Click Start Backup. The Backup Job Information dialog box appears. Click Advanced. Under Backup Type, click Incremental. From the Backup Job Information dialog box, click Start Backup to start the backup operation. Once completed, move the backup file you just created to the new WSUS server. On your new WSUS server, click Start, and then click Run. Click the Restore and Manage Media tab, and select the backup file you created on the old WSUS server. If the file does not appear, right-click File, and then click Catalog File to add the location of the file. In Restore files to, click Alternate location. This option preserves the folder structure of the updates; all folders and subfolders will appear in the folder you designate. You must maintain the directory structure for all folders under \WSUSContent. Under Alternate location, specify the folder where updates are stored on the new WSUS server. By default, WSUS stores updates at WSUSInstallationDrive:\WSUS\WSUSContent\. Updates must appear in the folder on the new WSUS server designated to hold updates; this is typically done during installation. Click Start Restore. When the Confirm Restore dialog box appears, click OK to start the restore operation. Alternative option would be use FastCopy Software. Copy and paste WSUS content from old server to new server. To import metadata into the database of the new Microsoft Windows Server Update Services Server, follow these steps:. Copy export.xml.gz or export.cab file from old server to new server using copy/Paste or FastCopy software. Note: It can take from 3 to 4 hours for the database to validate content that has just been imported. In Group Policy Object Editor, expand Computer Configuration, expand Administrative Templates, expand Windows Components, and then click Windows Update. In the details pane, click Specify Intranet Microsoft update service location. Set the intranet update service for detecting updates box and in the Set the intranet statistics server box. With the new server details and port For example, type http(s)://newservername :Port in both boxes. Open PowerShell command prompt as an administrator in any computer. Run Invoke-GPUpdate Servername to synchronise server with new WSUS Server. Collect source and destination server name, IP address, Database Name, Instance Name, service account for Database instance. Download Microsoft SQL Server Management Studio and install on source and destination SQL Server. Do not run initial configuration wizard in Destination Server. As best practice, do not migrate WSUS into a Domain Controller. 1. Right-click in the Taskbar, click Properties, highlight Toolbars, and then click Address. 2. Type lusrmgr.msc, and then press ENTER. 3. In in the console tree of the Local Users and Groups MMC snap-in, double-click Users. 4. Manually create a list of the local users. 5. In the console tree of the Local Users and Groups MMC snap-in, double-click Groups. 6. Manually add the users from the source server to the WSUS Administrators and WSUS Reporters groups. 1. 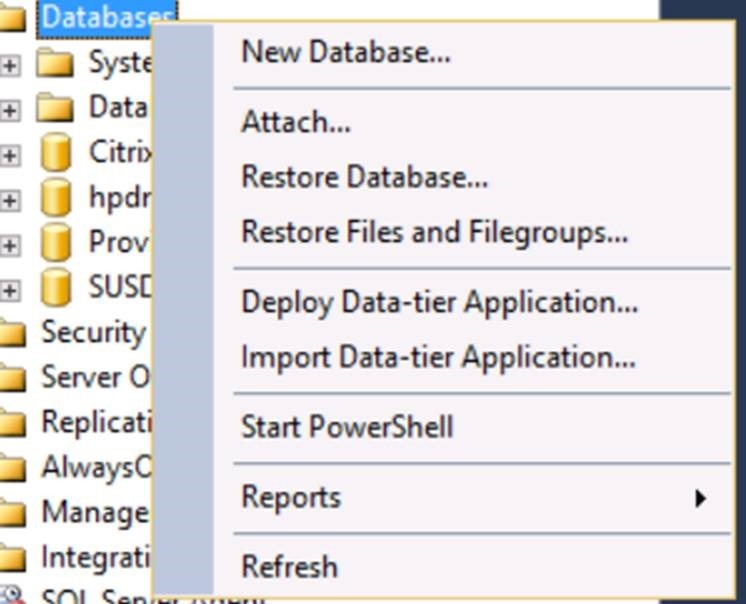 After you connect to the appropriate instance of the database in Object Explorer, click the server name to expand the server tree. 2. Expand Databases, and select the SUSDB database. 3. Right-click the database, point to Tasks, and then click Back Up. The Back Up Database dialog box appears. 4. In the Database list, verify the database name. 5. In the Backup type list, select Full. 6. Select Only Backup. only backup is a SQL Server backup that is independent of the sequence of conventional SQL Server backups. 7. For Backup component, click Database. 8. Accept the default backup set name that is suggested in the Name text box, or enter a different name for the backup set. 9. Follow the prompt to complete backup. 3. Right-click the database, point to Tasks, and then click Restore. The Restore Database dialog box appears. 4. On the General page, use the Source section to specify the Source. 5. In the Destination section, the Database box is automatically populated with the name of the database to be restored. 6. In the Backup sets to restore grid, select the backups to restore. This grid displays the backups available for the specified location. By default, a recovery plan is suggested. Before you begin installing WSUS server into the destination server you must install Microsoft .NET Framework, Background Intelligent Transfer Service (BITS) 2.0 and Microsoft Internet Information Services (IIS) on the destination server. Follow the procedure to install WSUS into destination server and point to the new Database. 1. 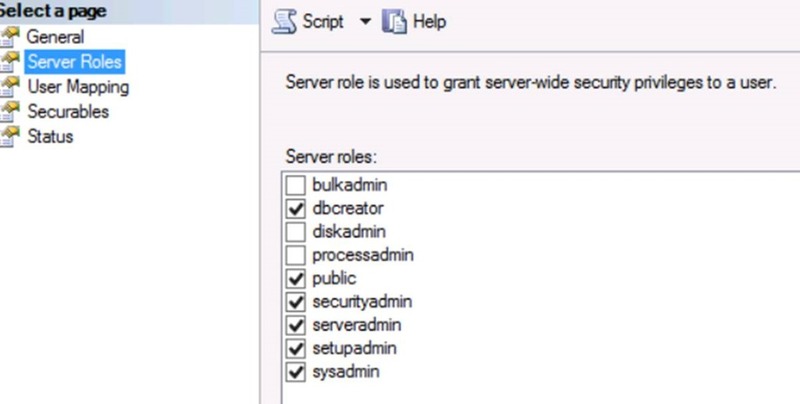 Open Server Manager, Click Add Roles and Features, Select WSUS and install WSUS role. 2. On the Welcome page, click Next. 3. Read the terms of the license agreement carefully, click I accept the terms of the License Agreement, and then click Next. 4. On the Select Update Source page, you can specify where client computers get updates. If you select Store updates locally, updates are stored on WSUS and you can select a location in the file system to store updates. If you do not store updates locally, client computers connect to Microsoft Update to get approved updates. 5. Make your selection, and then click Next. 6. On the Database Options page, click Use an existing database server, and select the instance name from the drop-down list. 7. Make your selection, and then click Next. 8. On the Web Site Selection page, you specify the Web site that WSUS will use. Note two important URLS: the URL to point client computers to WSUS and the URL for the WSUS console where you configure WSUS. 9. Make your selection, and then click Next. 10. On the Mirror Update Settings page, you specify the management role for this WSUS server. 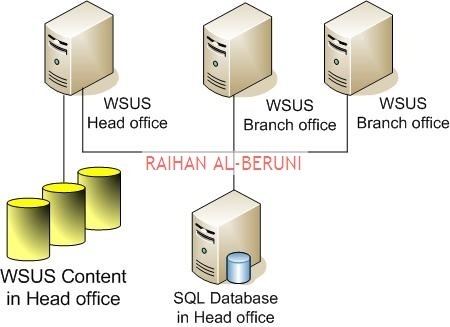 If you want a central management topology, enter the name of the upstream WSUS server. If this is the first WSUS server on your network or you want a distributed management topology, skip this screen. 11. Make your selection, and then click Next. 12. On the Ready to Install Windows Server Update Services page, click Next. Performing this step guarantees that WSUS-managed clients are not affected during the migration process. If the source server and the destination server run with the same identity, and a change is made to one of the servers, the communication between the client and server will fail. 1. Open the Local Group Policy Editor, and in Specify intranet Microsoft update service policy, change the URL to reflect the new WSUS server. 2. Update the Group Policy settings that are used to point WSUS clients to the WSUS server by entering the FQDN of the new WSUS server. After you have updated the Group Policy settings, WSUS clients will synchronize with the new WSUS server. 3. To force the clients to detect the new destination server, open a command prompt, and run wuauclt.exe /resetauthorization /detectnow and GPUpdate /Force. In Server Manager, click Tools, and then click Windows Server Update Services. In the WSUS Administration Console, expand Computers, and verify that all the Computer Groups that existed on the source server are displayed. Expand Synchronizations. In the Actions pane, click Synchronize now. After the synchronization is complete, (this may take several minutes), confirm that Succeeded is displayed in the Results column. Open WSUS Group Policy, Edit Group Policy and Change WSUS Server. After the detection is finished, open Windows Explorer and check the %WinDir%WindowsUpdate.log to verify that the forced detection was successful. Step3: Detect and authorize client to WSUS Server. Run the following in elevated command prompt. This article provides actionable advice about how to manage patches to reduce downtime while still maintaining the security of software services through the proactive reduction of dependencies and the use of workaround solutions. Windows Server patches, hotfixes and service pack is critical for compliance, service level agreement and security purposes. Keeping an operating systems and application up to date is the key to align your infrastructure with latest software. Patches and hotfixes also enable you to prevent any security breaches and malware infection. It is highly recommended that you patch Windows Servers, Windows Clients, Office, Applications (Silverlight, .Net Framework, SQL, Exchange, SharePoint, FF TMG). If you have clustered environment like SQL, Exchange and SharePoint then create Prod1, prod2 group and place each node on each group. System administrators should maintain a log, written or electronic, of all changes to the operating environment, to include hardware, system security software, operating system, and applications. Prior to any changes being implemented on a system, the system administrator should receive approval of stakeholders. Why am I discussing backup with patching best practice? In case of emergency you can rollback completely and restore a server to its original state if necessary. It is very important that servers be backed up on a regular basis. Depending on the use of the server, it may be adequate to backup the server once per week. A backup of a more critical environment may be needed daily, and possibly continuously. The backup program provided with Windows is capable of backing up to virtually any writable media, which can include network drives provided by a server in another physical location. This program is also capable of scheduling backups which can ensure backups occur on a regular interval. A full backup of all databases on the server. A system state backup of the server. A snapshot of virtualized exchange server. Delete snapshot after successful patching and updating. Read release notes of each hotfixes you are going to apply so that you are compliant with the application installed on the server. Consult with application vendor before applying service pack to any server if the server is hosting specific business application. Consult with application engineer about the importance of server patching. Inform and educate application engineer as much as possible to avoid conflict of interest. Documentation released with the updates is usually in the form of web pages, attached Word documents and README.TXT files. These should be printed off and attached to change control procedures as supporting documentation. A back-out plan will allow the system and enterprise to return to their original state, prior to the failed implementation. It is important that these procedures are clear, and that contingency management has tested them, because in the worst case a faulty implementation can make it necessary to activate contingency options. Historically, service packs have allowed for uninstalling, so verify there is enough free hard disk space to create the uninstall folder. Create a back out plan electronically and attach with change management software. You need to notify helpdesk staff and support agencies of the pending changes so they may be ready for arising issues or outages. Always install the same service packs or hotfixes to each SQL server node, Exchange DAG member and Domain Controller. A scheduled maintenance window must be agreed with business so that application outage and server reboot can maintain a respectable Service Level Agreement (SLA). If you have a large infrastructure with thousands of servers and many regions working round the clock then you must consider application dependencies. A patching schedule can be considered in between every Friday of every month at 6:00 P.M. Friday to 6:00 A.M Monday. Setup maintenance window in system center or deadline for WSUS to make sure patches are applied when you want instead of when patch is available. In this way you will have a complete control over change windows approved by change advisory board (CAB). Do not allow end users to update patches on their client machine according to their wishes and happiness! then user will never install any patch. I strongly recommend that you spend few $$$ to buy Microsoft System Center 2012 to manage and deploy Windows patches, service pack and hotfixes. However you can use Windows Server Update Services (WSUS) as poor man’s patching solutions. Patching DMZ server can be accomplished using WSUS offline patching solutions available for free to download from http://download.wsusoffline.net/. Automated patch management using System Center could enable a single IT administrator to access a pre-populated patch policy. He then could execute the command and with the press of a single button, download the patches from Microsoft’s website, install them on a test machine and test for compatibility issues. Meanwhile, an automatic inventory check could search for systems with the affected software, wake them up, check their readiness and push the verified patches out to waiting machines. The patches would then be automatically installed on each system, and they’d reboot as necessary. The final step is an automated report on the status of the remediated devices. Standardized patch management processes could allow for daily assessment and remediation of client devices and weekly assessment and remediation for servers. Reports can then be generated to validate system status on a weekly or bi-weekly schedule. A systems monitoring task that used to take days now takes minutes, and patches are deployed more completely and consistently across the entire IT environment. A single IT administrator can proactively manage thousands of systems tasks in the same amount of time it took an entire team to do the tasks manually. Some application may require reboot of server before patching such as RSA Secure Console. However most of the server must be rebooted after patching. Do not suppress reboot after patching in any circumstances or you will have a messy environment and broken clusters. The most prominent 32-bit application you’re likely to see on a 64-bit Windows system is Office. In this sort of situation System Center benefits most because you can adjust and make decision based on architecture and compliance as well. You can approve patches based on “Needed and Not Installed”. If a server or client need update it will install if not then it will not installed. It’s safe to do so. Servers are vulnerable to many forms of attack. Implementation and standardization of security methods should be developed to allow early and rapid deployment on servers. It’s important that a Windows server be equipped with a latest centrally managed Antivirus program. Antivirus update must be scheduled with the same maintenance window to update antivirus with latest definition. Servers have a powerful auditing feature built in. Typically, server managers would want the auditing system to capture logins, attempted logins, logouts, administrative activities, and perhaps attempts to access or delete critical system files. Auditing should be limited to gathering just the information that is needed, as it does require CPU and disk time for auditing to gather information. Log Management software should be used, if possible, for ease of managing and analysing information. Report can be generated from Systems Center and WSUS as proof of patching cycle. Servers keep multiple logs and, by default, may not be set to reuse log file entries. It is a good practice to expand the size of the allowed log file and to set it to reuse space as needed. This allows logging to continue uninterrupted. How far back your log entries go will depend on the size of the log file and how quickly you are accumulating log data. If your server environment is critical, you may wish to ensure that the log file size is sufficient to store about 30 days of logging information, and then rotate log files once per month. 3. Click the Advanced tab, and then locate the Security section. 4. Clear the Check for publisher’s certificate revocation check box, and then click OK.
5. After the update rollup installation is complete, select the Check for publisher’s certificate revocation option. 1. Ensure that you have downloaded the appropriate rollup to a local drive on your Exchange servers, or on a remote network share. 2. Run the Windows Installer *.msp Setup file that you downloaded in step 1. To update all DAG members, perform the following procedures on each DAG member, one at a time. Set the member server in maintenance mode using this PowerShell Command. 1. Close all Exchange management tools. 2. Right-click the Exchange update rollup file (.msp file) you downloaded, and then select Apply. 3. On the Welcome page, click Next. 4. On the License Terms page, review the license terms, select I accept the License Terms, and then click Next. 5. On the Completion page, click Finish. Start the Services MMC snap-in, and then verify that all the Exchange-related services are started successfully. Log on to Outlook Web App to verify that it’s running correctly. Restore Outlook Web App customizations, and then check Outlook Web App for correct functionality. After the update rollup installation is complete, select the Check for publisher’s certificate revocation option in Internet Explorer. See “Certificate Revocation List” earlier in this topic. You can install Windows service packs on Windows Server Failover Cluster nodes using the following procedure. Administrative privilege is required to perform the following tasks. Check the System event log for errors and ensure proper system operation. Make sure you have a current backup and updated emergency repair disk for each system. In the event of corrupt files, power outage, or incompatibility, it may be necessary to revert back to the state of the system prior to attempting to install the service pack/hotfixes. Expand Node A, and then click Active Groups. In the left pane, right-click the groups, and then click Move Group to move all groups to Node B. Open Cluster Administrator, right-click Node A, and then click Pause Node. Install the service pack on Node A, and then restart the computer. Check the System event log for errors. If you find any errors, troubleshoot them before continuing this process. In Cluster Administrator, right-click Node A, and then click Resume Node. Right-click Node B, and then click Move Group for all groups owned by Node B to move all groups to Node A. In Cluster Administrator, right-click Node B, and then click Pause Node. Install the service pack on Node B, and then restart the computer. In Cluster Administrator, right-click Node B, and then click Resume Node. Right-click each group, click Move Group, and then move the groups back to their preferred owner. Check the event log for errors and ensure proper system operation. Under Actions (on the right), click Move this service or application to another node, then choose the node or select Best possible. In the Failover Cluster Manager snap-in, right-click Node A, and then click Pause. Install the service pack/hotfixes on Node A, and then restart the computer. Check the event log for errors. If you find any errors, troubleshoot them before continuing this process. In Failover Cluster Manager snap-in, right-click Node A, and then click Resume. Under Actions (on the right), click Move this service or application to another node, then choose the node. Note: As the service or application moves, the status is displayed in the results pane (in the center pane). Follow the Step 9 and 10 for each service and application configured on the cluster. Install the service pack/hotfixes on Node B, and then restart the computer. From the Failover Cluster Manager snap-in, right-click Node B, and then click Pause. In Failover Cluster Manager, right-click Node B, and then click Resume. You can use the following PowerShell Cmdlet to accomplish the same. It is critical that when service packs, hotfixes, and security patches are required to be installed, that these best practices be followed. 1. Read all related documents. 2. Use a change control process. 3. Apply updates that are needed. 4. Test patches and hotfixes on test environment. 5. Don’t get more than 2 service packs behind. 6. Target non-critical servers first. 7. Service Pack (SP) level consistency. 8. Latest SP instead of multiple hotfixes. 9. Apply only on exact match. 10. Subscribe to Microsoft email notification. 11. Always have a back-out plan. 12. Have a working Backup and schedule production downtime. 13. Consistency across Domain Controllers and application servers. The following are systems requirement you have to meet before you deploy FCS. Install and configure WSUS server before hand for update services. Follow the step by step guide to configure WSUS. Client computers are Windows XP, Windows 7, Windows Server 2003, Windows server 2008, vista and windows HPC with windows update services running. Note: FCS does not support SQL server 2008 and Windows Server 2008 R2. Insert disk into FCS server or mount FCS ISO if you want virtualize FCS server. For the shake this article, I am showing all the component in the component selection. However, in practical you have choose right server roles to deploy FCS. WSUS Deployment: You must specify that Automatic Updates download updates from the WSUS server rather than from Windows Update or Microsoft Update. In the Group Policy Object Editor dialog box, expand Computer Configuration, expand Administrative Templates, expand Windows Components, and then click Windows Update. In the Setting list, double-click Configure Automatic Updates. In the Configure Automatic Updates dialog box, click Enabled, and then click OK. In the Setting list, double-click Specify intranet Microsoft update service location. In the Setting list, double-click Allow Automatic Updates immediate installation. In the Allow Automatic Updates immediate installation Properties dialog box, click Enabled, and then click OK. In the WSUS console, click Options, and then click Synchronization Options. On the Synchronization Options page, under Update Classifications, click Change and verify that the following check boxes are selected: Critical Updates, Definition Updates, and Updates.Click OK. In the console, click the Updates icon. Select the most recent Client Update for Microsoft Forefront Client Security, and then under Update Tasks, click Approve for installation. In the Approve Updates dialog box, click OK. In the End User License Agreement dialog box, click I Accept. In the Client Security console, click the Policy Management tab. On the Policy Management tab, click New. In the New Policy dialog box, enter the settings you want for this policy. After you finish creating the policy, click OK. In the Client Security console, click the Policy Management tab, and then click the policy you want to deploy. In the Deploy dialog box, select the targets to which you want to deploy the policy. You can add multiple targets to deploy the policy. Click Add OU/GPO/Group. The Active Directory dialog box appears and lists the top-level OUs. Under Select a target, find an OU to which you want to deploy the policy and select it. If you want to deploy a policy to all of the managed computers in a domain, you can select the domain instead of an OU. Click Deploy. Client Security deploys the policy to the targets you selected. If you deployed the policy to an OU and you want the policy to take effect immediately, you can run the gpudate /force command on each client computer in the OU or restart each client computer. Otherwise, the policy is applied to client computers when the standard Group Policy refresh occurs. On the Client Security management server, click Start, click All Programs, click Microsoft Operations Manager, and then click Administrator Console. In the MOM 2005 Administrator Console, under Console Root, expand Administration, expand Computers, and then click Pending Action. In the Pending Action list, right-click the client computer, and then click Approve Manual Agent Installation Now. If you do not see the client in the Pending Action list, wait a few minutes, and then on the Action menu, click Refresh. In the Microsoft Operations Manager dialog box, click Yes to confirm approval. The client computer will disappear from the Pending Action list. Note: During the installation of FCS, a basic version of MOM install in FCS management server. Forefront TMG maintains the definitions of known viruses, worms, and other malware. To keep these important definitions up to date, Forefront TMG has built in a centralized mechanism called the Update Centre that allows the administrator to configure the update frequency as well as the automatic update action. The Update Centre can be accessed from the Forefront TMG console. Network Inspection System (NIS) Microsoft Update delivers signatures and protocols that help protect the network. Malware Inspection Microsoft Update delivers Microsoft Antivirus definitions to filter virus-infected files that can be downloaded by the users from the Internet. Forefront Security for Exchange (FSE) Recipient Update Services deliver definitions to multiple antivirus engines used in FSE. URL Filtering Updates Microsoft Updates delivers new URL Filtering categories to filter out unwanted sites. 1. Log on to WSUS server. 2. Open WSUS Console. In the left hand pan Click Options. 4. On the Products Tab, scroll down to Forefront. Check Forefront Threat Management Gateway Definition update for HTTP malware Inspection, check Forefront TMG MBE and Forefront TMG definition update for Network Inspection system. 5. Click on Apply and Ok. Close WSUS Console. 1. In the left pane of the TMG management console, click Update Centre. 4. Highlight Malware Inspection and click Configure Selected. 6. The default automatic update action is Check For And Install Updates. The other two options available are Only Check For Updates and No Automatic Action. For this example we will leave this at its default and recommended setting. interval in which TMG will poll for new definition updates. This can be increased up to 4 hours. a certain number of days. The default value for that is set to 5 days. 10. Highlight Network Inspection Service (NIS) and click Configure Selected. Again the Definition Update Configuration settings for NIS appears, which is the same as what we saw for Malware Inspection except for the number of days to trigger an alert (45 days for NIS). 13. TMG uses Microsoft Update services to deliver malware updates to TMG. For TMG to receive these updates make sure that the option Use The Microsoft Update Service To Check For Updates is selected. 15. The option selected by default is Use Machine Default Service But Fallback To Microsoft Update. Here, check use Windows Server Update Services (WSUS). 16. Click Apply and OK to return to the TMG console. In order to counteract against outside threats such as bugs, malware, spyware and vulnerabilities, systems administrators need to update the Microsoft products constantly. Microsoft Windows Software Update Services (WSUS) allows systems administrator centrally deploy windows products updates, hotfixes, service packs, features and patches. One of the importance benefits of using WSUS is that updates will only be deployed if they are authorized by the WSUS administrator. Microsoft Windows Software Update Services has advanced features like reporting, allowing the grouping of computers, setting up deployment time and auto installation. WSUS will make the life of a systems administrator a lot easier. Microsoft Windows Software Update Services provides a robust, easy to deploy and easy to manage patch/update management system.Although there are third party products that accomplish the same thing, WSUS provides one advantage that none of its competitors provide and off course it’s free! In deploying WSUS 3.0, you have the option to create different topologies depending on your environment and specific needs. Most basic deployment is single server, Enterprise deployment using upstream and downstream server that is using multiple servers for load balancing, and most advance deployment would be multiple servers, remote database and WSUS contents in SAN. In the single-server topology, WSUS 3.0 runs on a single-server that downloads updates directly from the Microsoft Update site and then distributes them to servers, desktops, and laptops throughout the internal network. the WSUS server synchronizes with the Windows Update site on the Web. During synchronization, WSUS determines if any new updates have been made available since it last performed synchronization. During the initial synchronization, the download can take an hour or longer, depending on the bandwidth of your organization. Regardless of the bandwidth, any additional synchronizations should be significantly shorter than the initial one. If you have a large organization but you don’t want to overload a single server, or your network covers multiple geographic locations. Server hierarchies probably make the most sense. In a server hierarchy setup, one server acts as the primary upstream server directly synchronizing with the Windows Update site. Downstream servers on the network then perform the same synchronization but with the upstream WSUS server and not the Windows Update site. You can also deploy branch cache server with this type deployment to save bandwidth. This type of deployment include multiple WSUS servers, back end SQL and WSUS content in a SAN. This topology option involves failover capabilities. By using network load balancing servers, administrators can provide more reliability while also improving performance. It starts by setting a back-end SQL Server 2005 cluster, then installing multiple WSUS front-end systems with Network Load Balancing (NLB). Entire WSUS server farm share same SQL and WSUS contents. It will add more flexibility in terms of adding more servers and contents. An administrator will be able manage server farm using one WSUS console. Laptops can be difficult to keep up to date on the newest patches and updates. These computers travel with their users (sales reps /support pros) from office to office and site to site. The roaming clients topology takes this into consideration. 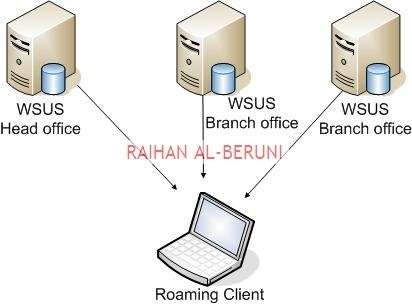 The roaming client topology allows the travelling laptop to pull its updates from the closest WSUS server, thereby reducing the chances of update traffic going across WAN lines. This topology is set up by entering (A) records in DNS for the WSUS servers but doing so with the same host name and different IP addresses. Once an administrator has done that, they set up netmask ordering and round robin on the DNS server. Netmask ordering restricts the name resolution to computers in the same subnet; if there is a location without a WSUS server, round robin will rotate through the list of available hosts on other subnets. As you see, there are many different setup options with WSUS that work in various network environments. This provides administrators with the flexibility they need to design and implement WSUS. Once the topology has been decided, we then need to install a WSUS server.